The Tyson Fury enigma: Which side will the world see of boxing's man of contradictions? From world champion to pariah, and back round to challenger, via mental illness, is a script that would impress any Hollywood celeb heading down from the hills for the big fight. Tyson Fury is really a rehab story with a cinematic possibility of him leaving the ring in Los Angeles as world champion for a second time. From the walk of fame to the path of shame, Fury has seen it all in a career of extremes. Not since Muhammad Ali has a heavyweight performed two major roles at once. Ali was an advocate of black liberation. Fury says he is fighting to support the cause of mental health. And yet, juxtaposed with that aim is his need to break the most fearsome puncher in the heavyweight division: the World Boxing Council champion, Deontay Wilder, who has scored 39 of his 40 wins by knock out. According to a new book by David Kipen, the poet W H Auden called Los Angeles “the Great Wrong Place,” but for Fury it turns out to be the right place to try something audacious. Alcoholic excess, recreational drug taking, a positive dope test, suicidal urges and a 10st gain in weight are the extraordinary backdrop to his quest to regain a world title almost three years to the day since he dethroned Wladimir Klitschko, who was baffled by the Lancastrian hulk sharing a ring with him. In this new, redemptive phase, Fury re-emerges fit, clean-faced and clear-headed, though with some of the old eccentricities intact. Wednesday’s final press conference was proceeding in diplomatic fashion until Fury’s voice filled the hall like that of a euphoric preacher. “I’m flying, I’m f****** flying,” he cried. Fury’s challenge for Wilder’s belt in a ring where Lennox Lewis defeated Vitali Klitschko 15 years ago could go several ways. Wilder could connect with one of his haymaking hooks or overhand rights to reveal the true cost to Fury of the three years he spent abusing his body and clinging to sanity. Or it could be a victory that earns Fury recognition for one of the greatest boxing comebacks. There are also plenty of messier permutations in between. But there is nothing mundane about it. Few fights have caused pundits to trade opinions on who might win in such long exchanges. In Fury’s bid for popularity here (he claims just about everyone on the streets knows him), you can see Americans being drawn to the idea of someone conquering demons on their TV screens while not quite knowing what to make of him and his entourage. He stands before them as an enigma who switches between saying the title is the dream of his lifetime to one who says it means nothing at all. He recalled his triumph over Klitschko: “It felt like, oh well, that was a load of rubbish. I just felt like an emptiness, a deep gaping hole of nothing, darkness, and grey clouds. Every day was grey. Fury’s message in that 50-minute exchange was: “I believe that if enough people talk about it it’s going to raise more and more awareness, and this crisis is going to have to be addressed properly.” And he has not strayed from that line throughout a build-up in which it would have been easier for him to stick to ring talk. Two years ago he was an outcast who people wanted banned from the BBC Sports Personality of the Year awards. In an interview, he had said: “There are only three things that need to be accomplished before the devil comes home: one of them is homosexuality being legal in countries, one of them is abortion and the other one's paedophilia.” Then he claimed that, ”"Zionist, Jewish people ... own all the banks, all the papers, all the TV stations.” A still-controversial positive test for nandrolone also damaged his standing. Contradictions abound. Logic, though, points to Wilder being a fast, hardened champion who, while lacking big-name victories, has a strong chin and always finds a way to send his opponents to the canvas. 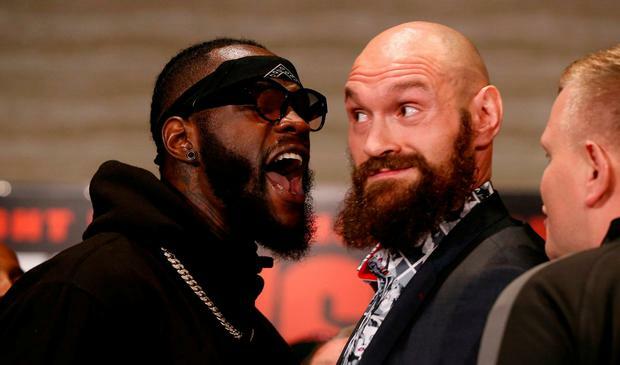 Wilder is also angry and hyped and sees Fury as a fine way to raise his profile, which is much lower in America than an unbeaten champion would expect. The ‘Great Wrong Place’ turns out to be the right place for two fighters with wildly contrasting objectives: for Wilder, another, fame-boosting knock-out, but for Fury, a way back to life, after his first burst of fame led him nowhere but down.